I just realized I never made an official announcement on here that I have a Patreon! I just sort of added it in with my links, haha. Well, now that I've updated my reward tiers, I suppose this is a good time. If you like my work, please consider supporting me through a monthly pledge on PATREON! I'm just your run of the mill caffeine enthusiast and comic artist. 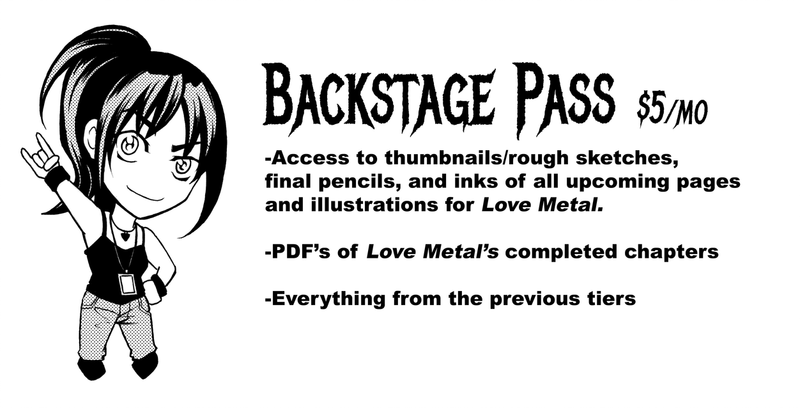 I write and illustrate Love Metal, a heavy metal romance brought about through blackmail (like all the best relationships). Dec 15, 2018 End of the year plans. Apr 12, 2018 New Speed Paint Vids! Hey! I see that you're writing your own manga, because I'm trying to write my own. I just have some questions.. So, I just want to hear your opinion on what could be a better option for me. I actually post my comic on quite a few sites. Personally, I think its important to make your comic as available as you can, and really branch out. You might get viewers on Smackjeeves or deviantart that you wouldn't have gotten from Webtoon or Tapas. I still have people who only read Love Metal on deviantart, and if I keep uploading here, there's always a chance someone new will see it. That's just my opinion though. I see people do just fine only posting to webcomic sites. So, I'd say it can work both ways. I hope that was helpful. Good luck with your comic! Hey! Thanks for your input. I asked ya about it because I was pretty reluctant to just post my whole comic/ manga on DeviantArt because I intend to make make money from it, so I was kinda thinking I'd put at least most of the story and pages on DA, Tapas, and other sites with patreon support, but I would save some extra content for hardcover copies that way one would have a reason to actually buy it.. ..If I can do that.. I'm only less that 10 pages into it and I don't really give myself time for it due to work, so that's why I'm trying.